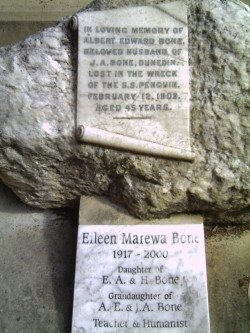 Eileen’s ashes are in the historic grave of her grandfather at the Karori Cemetery, Wellington. Her grandfather was drowned in the wreck of the Penguin in 1909 and the grave now forms part of the historic ‘Penguin Walk‘. Eileen Bone whose obituary and charitable trust are explained below was an exceptional person who lived by example. She was the consummate Humanist being both a ‘people person’ caring genuinely and deeply for all walks of life and also understanding that clear thought, research and the scientific method are the way to improve the human lot. The grave is in the Karori Cemetery which is at the north (city) end of Karori Road. In 1994 the Penguin Walk held a public information day. Eileen with her sense of family and history as well as a desire to teach and inform and a love of nature got great pleasure in the renewed interest in her grandfather’s grave. Being unable by then to guide or participate physically, she went to the grave to meet the walkers. As you view the grave, picture a larger than average, attractive, slightly plump, smiling elderly woman, still at that time with the distinctive dark black dyed hair. She would have enjoyed your company as much as you would enjoy hers. Or perhaps you may think of the younger dynamic teacher without formal training who set new standards of child centred education in both prestigious and tough schools in New Zealand and England because she wanted youngsters to learn and not merely be a taught. Walking: Take a bus or drive and as you enter Karori Road at the top of the rise into the main area of Karori, on your right at a very short distance, and beside the fire station is the entrance to the cemetery. There are many other ways to get to the grave, but this is the easiest to describe. Enter the main gate either walking or driving and drop gently down past the war graves until you come to the branching of several driveways. Turn right up a quite steep drive past the spectacular ‘Underwood’ mausoleum, with its angel on top. This is also a Penguin grave. At the top of the rise you are forced to bear right. A short distance down and ahead is an intersection with sign that tells you the gate beyond closes at dusk. If you enter from the Old Karori Road entrance you will come up this drive. But you have approached from over the hill from the main gate so at this sign turn left down a short drive towards a left sweep and on your right is a path and the grave of ‘Wong Hing Way’. You have in fact gone the right way. Go down this walking track to the third path and turn right. The fifth grave is the one you seek. You can see the marble ‘rock’ from the walking track. The total distance from the gate is about 500 metres, in good condition but steep in places. Bus: The very frequent Karori bus service (03) is in Karori Road about a minutes walk from the gates of the cemetery. Get off at ‘Marsden Village’ as you first enter Karori. Driving: Drive to Karori, turn right towards the Fire Station as you first enter Karori at the top of the hill. The gates of the cemetery are there. You can also enter the cemetery from ‘Old Karori Road’ beside Ian Galloway Park. The cemetery is now a public park. Please respect the narrow drives, children, animals and elderly people you will encounter. General: Follow the walking instructions through the cemetery whether or not you have a car. It is difficult to describe the paths of the cemetery. Do your best but be prepared for some extra walking or driving.